Lewis McGugan's superb long-range free-kick helped Nottingham Forest secure a fine home victory over Ipswich. Forest made a strong start and went ahead after Chris Cohen crossed for David McGoldrick to side-foot home. Jack Colback came close to equalising when Luke Chambers cleared his shot off the line before McGugan found the top corner with a wonderful 35-yard drive. 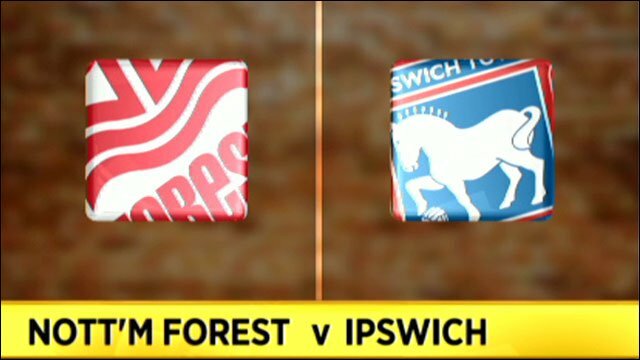 Forest's Nathan Tyson had a penalty shout rejected and Ipswich pressed late on but the hosts held firm. It was a second successive victory for Forest and means they have risen to 10th in the Championship table. For Ipswich it was a third straight defeat and they have now won only one of their last six matches. Earlier in the week Forest's assistant manager David Kelly said McGugan was playing with "magic in his boots", having seen the 21-year-old score a superb free-kick against Middlesbrough and a fine solo effort at Barnsley. And McGugan justified the glowing praise with his strike on the stroke of half-time to help secure all three points. McGoldrick's inclusion resulted in a change in formation up front, with the former Southampton striker playing on his own ahead of an attacking midfield. Boss Billy Davies' tactical switch paid dividends as early as the 12th minute, with Forest taking the lead after a strong start. Majewski sent a sublime pass down the line to Cohen, who continued before sending an inch-perfect cross for McGoldrick to tap in. After taking the lead, Forest continued to find a lot of space in the Ipswich half but were almost undone midway through the half. Colback evaded the attention of Forest's defence but saw his shot cleared off the line by Chambers, before the same man blocked another goalward drive moments later. The home side survived and continued to edge the opening period, although McGugan's wayward 25-yard effort in the 31st minute never threatened the Ipswich goal. But on the stroke of half-time McGugan found his range in extraordinary fashion, unleashing a 35-yard set-piece that flew past Ipswich keeper Marton Fulop. McGugan continued in a similar vein of form after the break and came agonisingly close to helping Forest to a third goal, with his cross evading Fulop but also Paul Anderson at the far post. Tyson had a seemingly stonewall penalty appeal waved away and as the clock wound down Ipswich began to attack with more vigour, Connor Wickham looking particularly dangerous. But the visitors could not break through as Forest kept a second straight clean sheet. 90:00+5:08 The referee blows for the end of the match. 90:00+4:46 Shot by Paul Anderson from outside the area goes high over the crossbar. 90:00+4:03 Free kick awarded for a foul by Luke Chambers on Tommy Smith. Jack Colback restarts play with the free kick. 90:00+2:37 Guy Moussi takes a shot. Save by Marton Fulop. 88:18 Foul by Connor Wickham on Chris Cohen, free kick awarded. Kelvin Wilson restarts play with the free kick. 87:48 Shot by Chris Cohen. Save by Marton Fulop. 87:16 Nathan Tyson produces a drilled left-footed shot from 12 yards. Blocked by Gareth McAuley. 84:37 Jack Colback has an effort at goal from just inside the box that misses to the right of the target. 83:49 Inswinging corner taken right-footed by Paul Anderson played to the near post, clearance made by Connor Wickham. 83:39 Centre by Chris Cohen, blocked by Jake Livermore. 83:13 Connor Wickham is caught offside. Free kick taken by Lee Camp. 82:37 Substitution Dele Adebola joins the action as a substitute, replacing Lewis McGugan. Correction - 82:08 Connor Wickham takes a shot. Brilliant save by Lee Camp. 82:08 Connor Wickham takes a shot. Save by Lee Camp. 79:15 Connor Wickham has an effort at goal. Save made by Lee Camp. 78:30 Grant Leadbitter takes the outswinging corner, Wes Morgan makes a clearance. 77:15 Jack Colback fouled by Paul McKenna, the ref awards a free kick. Grant Leadbitter produces a strike on goal direct from the free kick, save by Lee Camp. 74:03 The ball is delivered by Tommy Smith. 72:49 Substitution Guy Moussi is brought on as a substitute for David McGoldrick. 72:40 Lewis McGugan sends in a cross. 70:27 The referee gives a free kick against David McGoldrick for handball. Free kick crossed right-footed by Grant Leadbitter, Lee Camp makes a save. 69:12 The ball is swung over by Carlos Edwards, save by Lee Camp. 68:16 Unfair challenge on Gareth McAuley by David McGoldrick results in a free kick. Direct free kick taken by Carlos Edwards. 66:05 Substitution Nathan Tyson joins the action as a substitute, replacing Radoslaw Majewski. 65:14 Free kick awarded for a foul by Chris Gunter on Jake Livermore. Direct free kick taken by Marton Fulop. 64:20 Outswinging corner taken by Jack Colback, clearance by Paul Anderson. 64:13 Jack Colback delivers the ball, clearance by Chris Gunter. 61:02 Connor Wickham handles the ball and concedes a free kick. Direct free kick taken by Lee Camp. 61:02 Substitution Ronan Murray comes on in place of Andros Townsend. 60:34 Centre by Andros Townsend, clearance made by Wes Morgan. 57:31 Lewis McGugan produces a cross. 55:47 Substitution Jaime Peters goes off and Jake Livermore comes on. 54:45 Paul McKenna crosses the ball. 54:33 Centre by Chris Gunter. 53:07 Paul McKenna fouled by Jack Colback, the ref awards a free kick. Chris Cohen restarts play with the free kick. Correction - 49:17 Free kick awarded for a foul by David Norris on Lee Camp. Lee Camp takes the direct free kick. 49:17 David Norris challenges Lee Camp unfairly and gives away a free kick. Direct free kick taken by Lee Camp. 49:07 Centre by Jaime Peters, save by Lee Camp. 48:34 Shot by Tommy Smith. Save by Lee Camp. 48:05 Outswinging corner taken left-footed by Jack Colback from the left by-line, Wes Morgan makes a clearance. 45:01 Substitution (Ipswich) makes a substitution, with Connor Wickham coming on for Jason Scotland. 45:00+1:44 The players leave the pitch at half time. 44:30 Grant Leadbitter challenges Chris Cohen unfairly and gives away a free kick. 44:30 GOAL - Lewis McGugan:Nott'm Forest 2 - 0 Ipswich Lewis McGugan finds the net with a goal from long distance to the top right corner of the goal. Nottm Forest 2-0 Ipswich. 43:37 Booking Grant Leadbitter is cautioned by the ref for unsporting behaviour. 42:27 The official flags David McGoldrick offside. Damien Delaney takes the direct free kick. 41:44 Grant Leadbitter takes a shot from deep inside the box clearing the bar. 39:25 The ball is crossed by Chris Gunter. 35:07 Radoslaw Majewski challenges Grant Leadbitter unfairly and gives away a free kick. Grant Leadbitter takes the free kick. 34:15 Unfair challenge on Gareth McAuley by David McGoldrick results in a free kick. Free kick taken by Gareth McAuley. 31:23 Free kick awarded for a foul by Andros Townsend on Paul McKenna. Kelvin Wilson takes the free kick. 30:47 Shot from outside the area by Lewis McGugan misses to the left of the goal. 29:18 Paul Anderson delivers the ball, Marton Fulop makes a save. 28:04 Chris Cohen produces a cross, Damien Delaney manages to make a clearance. 27:38 Handball by Grant Leadbitter. Paul McKenna takes the direct free kick. 26:56 David McGoldrick is caught offside. Free kick taken by Marton Fulop. 26:12 Jack Colback challenges Kelvin Wilson unfairly and gives away a free kick. Free kick taken by Lee Camp. 24:51 Radoslaw Majewski gives away a free kick for an unfair challenge on Andros Townsend. Free kick crossed left-footed by Jack Colback. 23:44 The official flags Paul Anderson offside. Marton Fulop restarts play with the free kick. 22:22 Centre by Luke Chambers, save by Marton Fulop. 21:52 David Norris gives away a free kick for an unfair challenge on Lewis McGugan. Free kick taken by Paul McKenna. 19:10 Jack Colback takes a shot. 18:20 Long range effort by David Norris goes wide right of the net. 16:29 Radoslaw Majewski produces a drilled right-footed shot from deep inside the area which goes wide of the left-hand post. 14:41 Corner taken by Grant Leadbitter from the right by-line, Gareth McAuley gives away a free kick for an unfair challenge on Wes Morgan. Direct free kick taken by Lee Camp. 14:08 Corner taken right-footed by Grant Leadbitter from the right by-line, Kelvin Wilson manages to make a clearance. 14:01 Jaime Peters crosses the ball, Wes Morgan manages to make a clearance. 12:12 Chris Cohen provided the assist for the goal. 12:12 GOAL - David McGoldrick:Nott'm Forest 1 - 0 Ipswich David McGoldrick fires in a goal from inside the six-yard box to the top left corner of the goal. Nottm Forest 1-0 Ipswich. 11:08 The assistant referee flags for offside against Paul Anderson. Direct free kick taken by Marton Fulop. 9:45 A cross is delivered by Grant Leadbitter. 8:42 Lewis McGugan crosses the ball, save by Marton Fulop. 7:25 The offside flag is raised against Jason Scotland. Lee Camp takes the direct free kick. 6:43 The ball is delivered by Grant Leadbitter, save by Lee Camp. 6:11 Foul by Luke Chambers on Andros Townsend, free kick awarded. Grant Leadbitter takes the direct free kick. 4:42 Unfair challenge on Jack Colback by Paul McKenna results in a free kick. Free kick taken by Andros Townsend. 2:47 Chris Gunter crosses the ball, save by Marton Fulop. 1:23 Carlos Edwards delivers the ball, Lee Camp makes a save. 0:46 Chris Cohen challenges Jaime Peters unfairly and gives away a free kick. Direct free kick taken by Marton Fulop.